The NCC cadets in Nalanda College are well trained and actively participate in different activities. 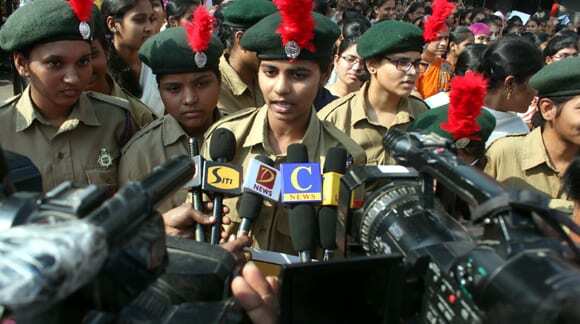 The girl cadets from the college have participated in Independence Day and Republic Day Celebrations. Students are provided excellent training and many even get B & C Certificates. They are always ahead in involving in social related activities and render services. We have also been granted permission for boys NCC Unit which is considered as an achievement. The NSS Unit of Nalanda Degree College Provides a platform for active student participation in community service and development activities. The Contribution and Commitment of the NSS volunteers is projected through various programs such as Blood Donation Camp, HIV Awareness, Slums Development, Navaratri Festival, NAVY Mela and more. The unit also organises special camps in nearby villages like Health Camp and Clean & Green Surveys.